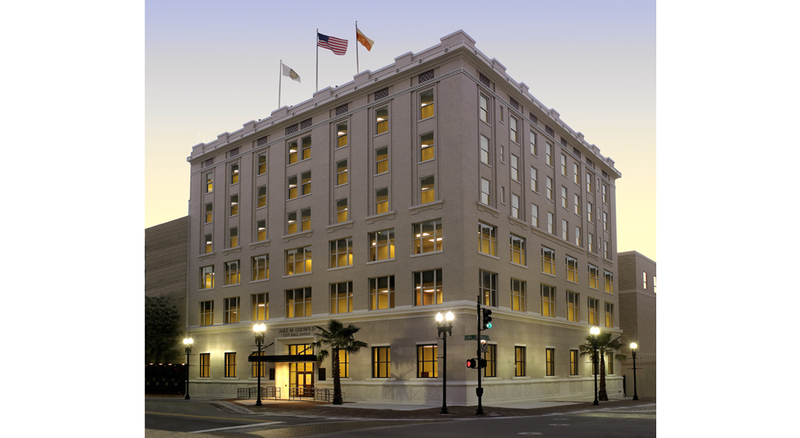 The building owner, Police and Fire Pension Fund, retained KBJ Architects to renovate this historic building to provide office space for three City of Jacksonville departments. The building was constructed in 1908 at the corner of Hemming Plaza, the city center of Jacksonville, and designed by the renowned Architect Henry J. Klutho. It was acclaimed the first high rise building in Florida at six stories. The building originally served as the Jacksonville YMCA and featured an indoor swimming pool, gymnasium, running track and a variety of roof top games. It was remodeled in 1930 and again in 1945 to provide retail and merchandise facilities. The building provides over 60,000 square feet of office space. The project includes selective demolition for extensive interior renovations, new elevators, air conditioning and electrical system, fire stairs and service facilities. The interior features a 100 seat public presentation and hearing hall. The exterior restoration includes all new windows and street level changes to adopt the original design features. The building is the first LEED® certified facility for the City of Jacksonville.